Having a beautiful lawn is something most of us dream of but what about a cleaner environment. With all the talk on global warming, greenhouse gases, carbon footprint and air pollution we feel compelled to do our bit as well. If you are wondering what this has to do with electric lawn mowers, read on to find out. Lawn mowers first began as hand pushed machines, followed by the gasoline fueled mowers and when air pollution began increasing the electric lawn mower made its appearance. You have a choice of corded and cordless mowers. Both machines come with their own advantages and disadvantages. You need to consider the type of lawn you have and the size of the lawn, the amount of obstacles like trees or other things on the lawn and whether you like to mow the lawn as a form of exercise or whether you dislike the job and like to get it over and done with. 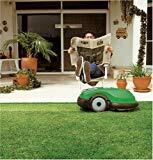 Small lawns of sizes up to half acre are quite suitable for electric lawn mowers. These machines have quite a few benefits over their non-electric counterparts. For starters we are not polluting the environment because there is no fuel being burnt and no exhaust fumes emitted. Electric mowers have made a tremendous improvement over the amount of pollution being emitted and fuel consumed. 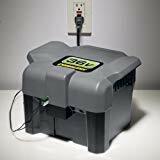 The corded electric lawn mower simply needs to be plugged into a power outlet and the cordless electric lawn mower is powered by a rechargeable battery. In relation to cost benefits, the electricity consumption for running your machine or charging the battery will probably reach five dollars at the most in a year. When you compare this to the high cost of gasoline which is something like three dollars a gallon you have your answer. One of the best advantages is the almost silent operation of the machine. It is such bliss to mow the lawn and enjoy the peace and tranquility of the day. Your neighbors will love you for this as well. There are states which offer rebates to people who change gasoline fueled machines for electric ones. In terms of maintenance, the electric lawn mower will need periodic maintenance and occasional repair work. However, it is very nice to think of not having to change filters and spark plugs that are a real messy job. These machines are so much cheaper to buy and maintain. In terms of safety this machines have a fairly high rating as well. Corded machines are rather limited in distance and range and dragging around lengths of electric cord, tripping you up at every turn is not fun. There is also a level of danger in running over the cord or getting an electric shock from damaged cord. The cordless machines offer you more flexibility and are a lot safer to use. No cords trailing after you. The start up switch is a welcome change to the pull-cord start of old. Though a bit noisy they are still nowhere near as noisy as the gasoline machines. The downside to cordless machines is the battery recharging which needs to be done approximately every 45 minutes or so. It is best to buy a unit that allows you to replace the battery and recharge as well. Though the cordless machine has a greater range than the corded one it is not good for big lawns and tall grass. 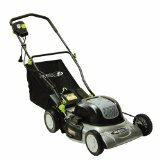 It is important to realize that every lawn mower is different and that you need to choose the machine that best suits your requirements.